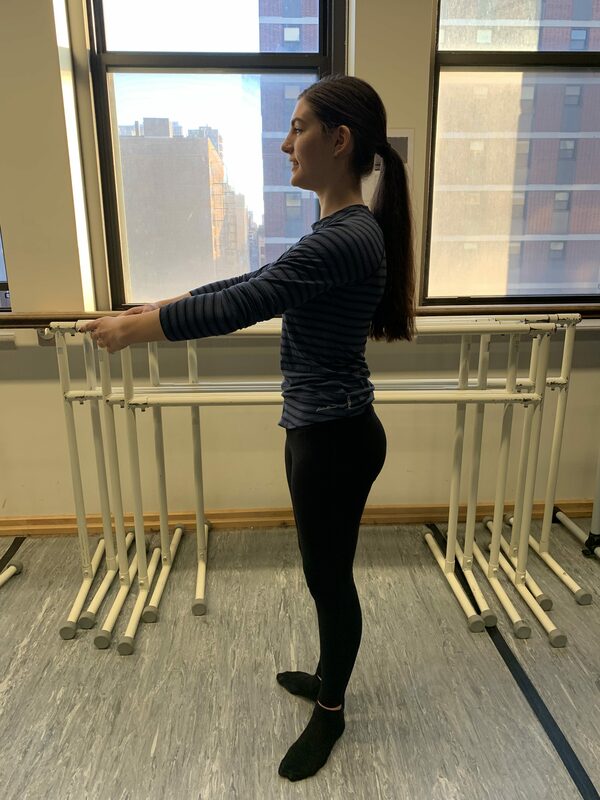 One of the most frequent and misleading corrections that is given consistently throughout many dancers’ history is to “pull up.” This photo demonstrates how one should stand in neutral posture, “pulled up,” with musculature of the hips and glutes equally balanced. “Pull Up:” What Does It Mean? One of the most frequent and misleading corrections that is given consistently throughout many dancers’ history is to “pull up.” This correction is often due to an anterior pelvic tilt, which is one of the most prominent and challenging postural deviations for dancers to deal with. According to a white paper from the International Association for Dance Medicine and Science, “dancers with a misaligned pelvis either anteriorly or posteriorly can more easily develop vertebral stresses and knee, foot, and ankle injuries due to compensatory movements and excess of muscle tension during training” (Gam and Urmston, 2015). Anterior pelvic tilt happens when the hip flexors are chronically shortened and the hip extensors are therefore elongated. There are various bone, joint and muscle components involved in the correction to “pull up.” Two of these components, the thoracic spine and the lumbar spine, provide both stability and mobility through the kinetic chain and to the torso. In order to move efficiently and with correct technique, a delicate balance between mobility and stability within the kinetic chain is essential. Another important component to pull up one’s hips is the pelvis. The pelvis is an irregular bone structure made of three bones: the ilium, the ischium and the pubis. Movement in the pelvic region is relatively limited because of strong ligaments and the fact that the pelvis is predominantly important for maintaining stability. To tilt the pelvis, the joints need to be able to provide a foundation that allows for axis of rotation in the joints involved. Though in this region planes of movement are relatively limited, sagittal, transverse and frontal planes of movement are possible. Pulling up occurs in the sagittal plane and requires various muscles to facilitate this movement. Some of the muscles involved in successfully “pulling up” are the abdominal (core) muscles, the hip flexors, lower back muscles, iliopsoas, rectus abdominis, and other lumbar muscles in the trunk. The psoas forms muscular bundles around the lumbar spine and acts to decrease lordosis. Contraction of the circular fibers of the transversus abdominis pulls the belly in, which is also a major component of “pulling up.” The rectus abdominis muscles are also involved in applying this correction, though they play a much smaller and less critical role. These muscles are well-known as the “six-pack” muscles, but this is a superficial view of the actual musculature required to “pull up.” The photos below offer three examples of “pulling up,” interpreted incorrectly. “Pulling up” from the chest changes the center of gravity, placing the weight toward the heels. Why is “pulling up” so misleading? The correction “pull up” can be quite misleading to dancers, and is sometimes more harmful than helpful. For this correction, there are adjustments that it intends for a dancer to make, and adjustments that dancers wrongly make as a consequence of hearing it. First, the correction “pull up,” as already mentioned, intends for dancers to lengthen their spines by lifting through the pelvis, elongating the spine and lowering the shoulders. This is done using musculature of the spine, pelvis, and the parts of the kinetic chain including the thoracic spine, lumbar spine and hip joints. While it would be nice if this correction was always interpreted correctly, hearing that correction often actually makes dancers adjust their bodies by allowing their stomach muscles to move concentrically and tighten, and by forcing their pelvis to tilt posteriorly. This can also lead to overcompensation with the hip flexors and unnecessary focus on the “six pack” that was previously mentioned. These movements may make a dancer feel more “pulled up,” but they are really tensing up the front of the body, not lengthening. When dancers “pull up” incorrectly, they decrease their mobility because they are tightening both their hip joints and their thoracic spine which are supposed to be for mobility. By tensing those to appear more “pulled up”, dancers are unable to move as well and the rest of the movements done in this “pulled up” position will not be done as freely. What does “pulling up” actually entail? Both strength and endurance are essential to adhere to this common dance correction. One must develop a baseline of core strength to engage these muscles while also building endurance to keep them engaged over long periods of dancing, whether it be in a class or during a performance. For many, addressing this correction requires a combination of applying different types of muscle action to use the correction to their advantage. One of these ways may include something as small as developing a better habit of always standing in a more neutral posture, rather than yielding to habitual postural deviations. Another way to apply this correction is to develop more strength in the lower abdominal muscles and back, while improving the flexibility of the hip flexors. Doing so will allow for better technique and habitually dancing in a “pulled up” position, which is the ultimate end goal. “Pulling up” correctly (and incorrectly) requires strength and muscular balance. It requires strength because dancers have to engage their core muscles and shoulder muscles to lengthen their spine. It also requires a substantial amount of endurance because dancers must be able to maintain that correct position while performing other movements with other parts of the body, such as doing a grand jeté. The book Conditioning for Dance by Eric Franklin (2004) argues that if a dancer trains part of their dancing without fixing their alignment first, they won’t get any better. This applies to the “pull up” correction and the execution of a grand jeté because if instructors tell dancers something that makes them tense up and lose their alignment, the rest of their training won’t improve. Though the correction to “pull up” can sometimes be misleading or particularly challenging, identifying the specific muscles, bones, joints and postural deviations that are involved can lead one to discovering a healthier way of facilitating movement and developing better overall technique. If “pull up” is so misleading, what should teachers say instead? To address this correction and make it more helpful to dancers, instructors should either change the wording or be more specific with the instruction. To change the wording, instead of “pull up”, an instructor could say “lengthen your spine”, or “lower your shoulders”. In being more specific, an instructor should say pull up a specific area of body (pull up from your hip joints or pull up out of you heels) instead of just a general “pull up” which dancers can (and do) interpret wrong. If a dancer was given a more specific correction, she would be less likely to take “pull up” as “tense up”, and would be able to create more movement efficiency through the kinetic chain. Performing this correction appropriately would also require less effort because dancers would only be adjusting a few parts of their bodies/ movements instead of trying to tense up every part of their trunks to appear more “pulled-up.” Every dancer moves differently and has a different body both internally and externally. Both instructors and dancers should have a basic knowledge of musculature and physical movement to allow correct application and specificity of corrections. With this, dancing can be immensely improved and implementing this correctly allows dancers to complete challenging movements such as a grand jeté. What is a grand jeté? As previously mentioned, a grand jeté is a leap in which the dancer travels through the air in a split position. In a more scientific or anatomical fashion, the take-off for a grand jeté entails hip and knee flexion and ankle extension, and takes place mostly in the sagittal plane. The first step in a grand jeté is the prep, which is often a chassé. This is when the front foot slides forward to put both feet on the ground with the knees in flexion. After this, the dancer jumps straight up, extending the knees, allowing the feet to be plantar flexed, or pointed. During this process the legs should come together. When landing, the knees should return to flexion once again. The next step in the movement is the actual leap. This is when the left foot has its time to shine. This foot will step forward while the right hip is in flexion, and the right knee is extended to the anterior side of the body. While this happens, the left hip and knee are doing the same motions to the posterior of the body. At this point, both feet should demonstrate plantar flexion. The final step is considered a follow through after the landing. When landing, the dancer will land on the right foot first with their knee in flexion. Then the left foot will come from the posterior to the anterior and step through again which returns the dancer to their original position. What parts of the body are involved in the execution of a grand jeté? Proper execution of a grand jeté requires correct usage of specific muscles. Some of these muscles are the hamstrings, the quadriceps, the glutes, the dorsal flexors, the psoas, the iliacus, sartorius, and rectus femoris. When the quadriceps contract, the knee will extend causing the lower leg to straighten which allows for the split position to be achieved in the air. As for returning to the ground, the hamstrings will contract which causes the knee to flex which makes the lower leg to be in the bent position. Other muscles, ligaments, and tendons contribute to the flexibility, stability and mobility of the overall movement. Though the movement of the lower extremities are highlighted, the arms, torso and head also play roles in the complete movement. This can be related to the kinetic chain because of the incorporation of most of the body in motion. The kinetic chain illustrates the flow of energy as the body creates and reacts to movement. Two of the most important elements of the kinetic chain in the execution of a grand jeté are the stability of the foot and the mobility of the ankle. These allow the dancer’s body to both generate power and absorb the impact that a grand jeté puts on the body. What are some mistakes dancers make while doing a grand jeté? Some common mistakes made during this movement are not allowing one’s knees to return to the flexion position. This is really important because it takes the strain and tension off of one’s leg from jumping and landing with all of one’s weight coming down along with gravity. Without the knee flexion throughout the movement, the dancer could easily experience long or short term injury. This movement requires the dancer to use a variety of muscles located in the legs, such as rectus femoris, the quadriceps, the hamstrings, psoas and iliacus (hip flexors). When the legs extend in the leap position, each of these muscles are working hard to maintain the position. A pronated foot and/or values knee on the landing of a jump contributes to the risk of knee injury. As was mentioned briefly in the previous paragraph, if a dancer lands with all of their weight on a knee that is not in proper flexion, it can cause a serious injury. A common injury from performing this movement incorrectly is a tear of the anterior cruciate ligament (ACL) in the knee. If the dancer lands a grand jeté with an extended knee or a hyperextended knee, the ACL will try to suddenly catch the dancer, and likely tear from the sudden stress. (Franklin, 2004). Altogether, the grand jeté is a complicated dance step that requires proper placement and alignment of many muscles and bones in order to look nice and for the dancer to avoid injury. A strong component of the movement is proper application of the common correction, “pull up,” which is often heard by dancers in class and throughout training. When all of these aspects are considered and applied to technique, dancers can achieve the effortless look of flying that is seen performed by professional dancers. Mary Ciancio is originally from Chicago, Illinois, but has lived in Knoxville, Tennessee since the beginning of high school. She is a sophomore pursuing a major in Criminal Justice and Criminology and double minors in Dance and Psychology of Crime and Justice. She greatly values social justice and her main focus is on methods of restorative justice, and hopes to use dance as a method of restorative justice inside prisons. Clarke Jackson is Saint Louis, Missouri native currently living in Chicago, Illinois. She is a senior at Loyola University Chicago and pursuing a Bachelor’s in Science with a focus in Biology. She is also a double minor in Bioethics and Dance. She hopes to become a successful pediatrician and become the owner of a dance studio in the future. Haile Clifton is a Junior from Clarkston, Michigan. She is pursuing a Film and Digital media degree with a minor in Dance at Loyola University Chicago. She plans to continue dancing in the future and hopes to find a career where she can merge dance and digital media in some sense. Franklin, E. N. (2004). Conditioning for Dance. Human Kinetics.